Quoting, Citing, & Paraphrasing on ! 1 DVD · 1 hr. 8 mins. 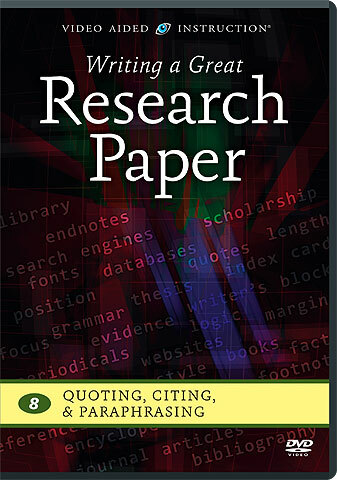 In this invaluable program, a research expert teaches you how to synthesize your research sources with your own ideas to form a cohesive paper that has one consistent voice: yours. You’ll learn the right ways to “plug in” the words of other writers within your own writing, so that your paper reads smoothly — and you sound mature, thoughtful, professional, and scholarly. NOTE: Information about the formatting of parenthetical references, footnotes, bibliographies, etc. is contained within the next program in the series, Formatting Your Paper.